In 1969, Julian Bond established the Southern Elections Fund to help elect local and state level candidates for office in the old Confederacy. In the early 1970’s, the SEF contributed campaign funds and technical advice to hundreds of candidates, many of whom were elected to office as part of a grassroots process that changed the nature and color of Southern politics. 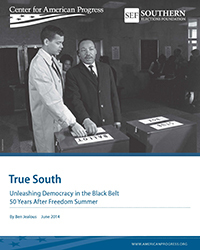 In 2014, Bond and Ben Jealous resurrected the Southern Elections Fund in order to combat voter suppression and accelerate the electoral impact of the South’s rapidly changing demographics. The modern-day Southern Elections Fund will work in the South to expand the electorate, develop new leaders of color, and ensure that enhanced electoral power brings progressive change.